The Mumbai Port Trust terrace Farm which is now 9 years old is a haven for birds, bees, insects hovering around the 150 varieties of plants thereat. However this spot is situated in a restricted area, with high security needs inside the port premises. My efforts to see more green roofs in the city needed the model to be replicated in another location which was more visible, accessible to those interested. Urban leaves started conducting workshops in Maharastra Nature Park since June 2009, the venue also became a place for practicals during workshops. Avinash Kubal Dy Director MNP, who has supported us all throughout suggested we take up the initiative to green the concrete space of about 400 sq ft on the water tank situated at ground level. This could be a replicated model of the farm at MbPT, which would inspire people to take up urban farming themselves. So the first steps to create a city farm at MNP were taken in September 2009 during a workshop when all participants did their hands on practicals , for making Amrut Mitti ( a nutrient rich soil/compost made from leaf litter and top soil) heaps. This activity became a starting point to meet, interact, watch over the progress of the Amrut Mitti every week. In the process a hand holding measure for participants of workshops evolved, wherein they could come, discuss their difficulties and problems and also volunteer for this work. Volunteers have thus become a core strength of this farm and Urban Leaves group. In a city like Mumbai where people don't have time for themselves, this hub was created where like minded people meet every week and enjoy an hour of gardening together. Now after an interval of six months our two batches of Amrut Mitti heaps are ready and we are eager to plant veggies and herbs in them. We have also planted Chikoo,( Sapota ) and Star fruit in drums with holes drilled in them from sides.More fruit saplings will be planted this month. The philosophy of a way of life, especially those of tribal societies, is best depicted through colorful images. 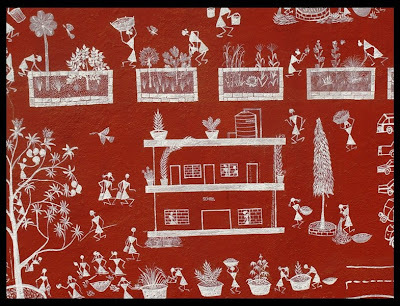 Trees, birds, men and women collaborate to create a composite whole in Tribal Paintings, and the paintings of the Warli tribe of Maharashtra are the most joyous celebration of that very philosophy. We thought that this was an apt medium for expressing what we had set out to create in an urban world. Sitting together at the park to create the design and theme had us all excited. 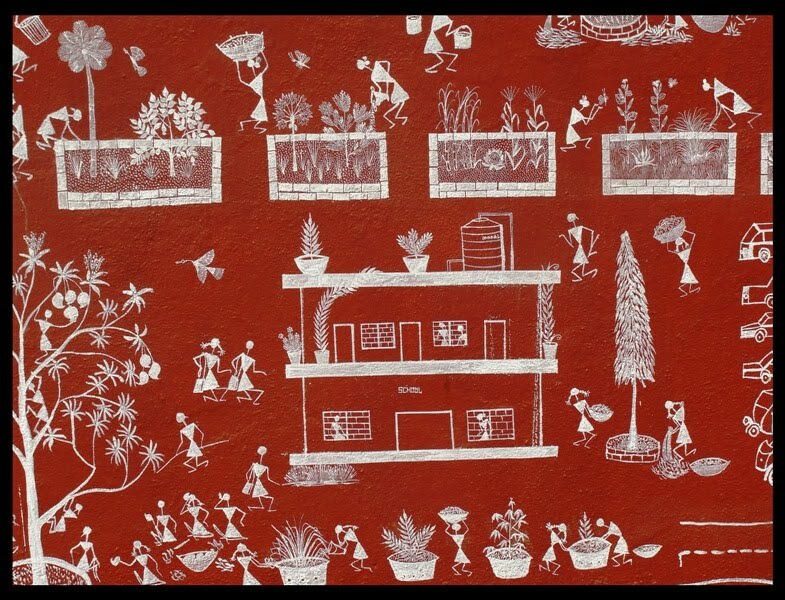 The artisan from Jawahar, Shri Sunil Kharpade took up the challenge of depicting an urban scene with a tribal art forms. He did full justice to it. So yes, all those of you there who wish to grow their own food, laugh and dirty their hands in soil, feel empowered with knowledge what to eat, when to eat and how to eat are invited to join us at Maharashtra Nature Park. You may send e-mail to urbanleaves@gmail.com to reach us. Will keep you posted on future developments shortly.